I love Rose (or sometimes it's called Swirl) Minky! Super soft and snugly! ... you can also use low pile fleece, terry cloth and cotton. If your machine is good with multi layers of thickness you can also use a low pile faux fur. Always use cotton unless you know your machine does well with multi layers of fabric. Wool Felt and Fleece don’t fray - Hooray! Cotton – woven – always use a heat n bond backing to stop fraying or the Diamond Stitch files. I usually use ‘light’ heat n bond, mainly because it allows the cotton to stay supple .. but the ‘permanent heavy’ kind works well too … especially if you cotton is a low thread count and frays easily. When you cut around the cotton on the tummy you must leave at least a 1/8 inch seam allowance away from the stitches. If you cut the cotton close to the stitches it will fray or just come off, and that’s no fun. If the light heat n bond isn't working for you you could always try the permanent one. I also like to iron it onto some felt before adding it to the tummy, that way it is sealed from both sides and is nice and stable. 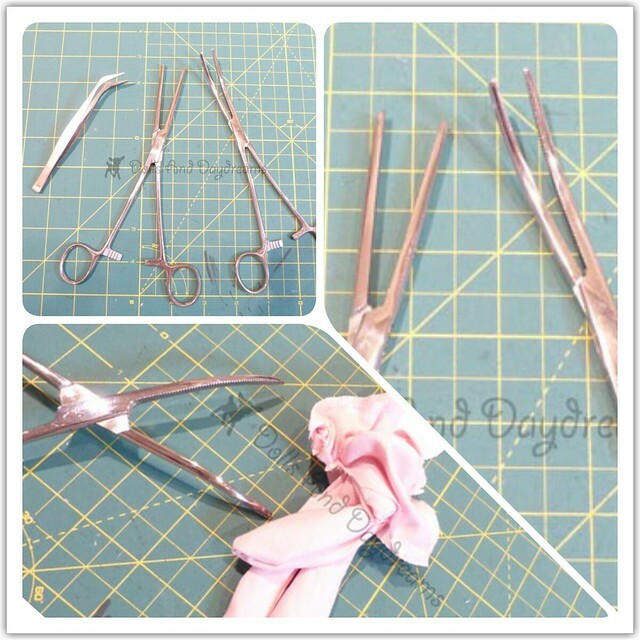 I love using this method in my sewing patterns also, please feel free to check it out for a step by step photo tutorial. How to Rescue your tummy fabric if you forgot to use Heat n Bond – As long as you left a good seam allowance (1/8 – ¼ inch you should be able to use this method). Grab your fray check and seal around the edges. Wait till it dries and then continue on with your stitching. Key Points in remember – Iron on Interfacing and always cut a 1/8 – 1/4 inch seam allowance. 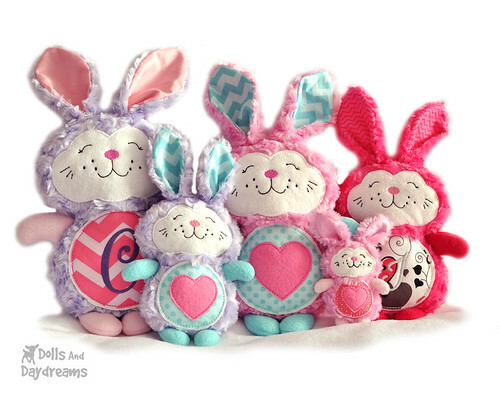 Now all of my cotton tummies and hair come with a Diamond Stitch option! As a toy designer I love light looking stitches like the Diamond, the heavier ones, like the Satin Stitch, not only add 1/2 an hour or more to the making of the toy but they often detract from the over all unique design. I love hemostats for turning! It makes turning small parts like limbs, and big fluffy friends a breeze! Go here for a full tutorial. When stuffing – don’t over stuff your limbs, keep them squishy and always leave a ¼ - ½ inch gap at the top. This will make sewing around your softie sandwich a breeze! If you are worried grab your painters tape and tape them down before you add the back piece. 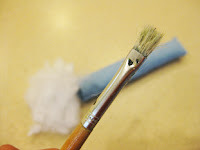 An old paintbrush or chopstick works wonderfully - the bristles grab the stuffing and helps you get it into all the corners. Always pull apart your stuffing before you use it. Then add small bits at a time and compact them down/place them using your chopstick or paintbrush. Poly-Fil (synthetic) is relatively cheap and easy to come by. It will give your doll or Softie a cute plump fluffy look, you’ll have to work a bit to get the wrinkles out of the head and neck area but it holds up well. Careful to fill all the 'holes', they can reappear down the road. Also I recommend using fleece for your 4x4 stuffies limbs and don't stuff them .. the fleece will make them look cute and chunky but it will be so much easier to turn! 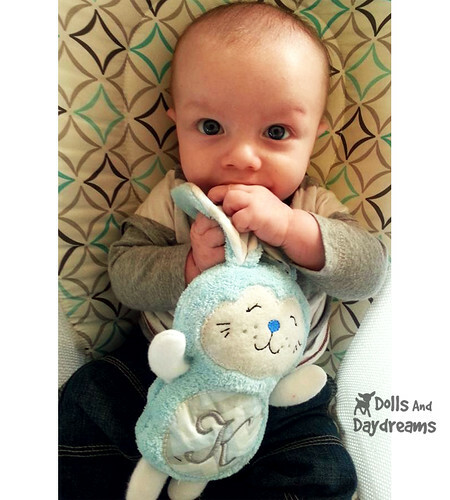 Embroider your child’s name, initials or date of birth onto their tummy fabric (fonts are not included in the patterns). Have fun being creative! How to: You will need software or a machine that has the ability to merge designs. Tips for minimal puckering on machine embroidered faces. If you are embroidering only the face fabric and are going to sew the doll by hand I suggest hooping your face fabric with the stabilizer. I use mesh cutaway for the stabilizer I hooped. Then I used temporary adhesive to put down the face fabric, smooth it out really well and keep smoothing it as it stitches it in place. Then when I got to embroidering the face, I floated a double piece (one piece folded over) of heavier tear away under the hoop (just tape it in place on the underside of the mesh stabilizer). Tear away that stabilizer after the face is done embroidering. Then after the doll is all finished and stuffed nice and firm, use your iron and steamed out the remaining wrinkles. She will look flawless. Find my faces range here! If you own a machine that does not work with these formats you can download free conversion software to convert your files at this website: http://www.wingsxp.com/index.php/my_editor/ If you are using a Bernina Embroidery machine and can only use .art format you will need the appropriate Bernina software to convert to .art format. Due to the number of different types of machines and models out there I suggest reading your user’s manual for transferring files over, contacting your dealer or find a friendly ITH forum and see if someone else has the same machine as you. Can’t find your Step by Step Photo Tutorial? The PDF Tutorial is inside the zip file. Mac users please open your PDF Patterns up directly in Adobe Reader and NOT Apple’s default PDF reader called Preview. Can’t find your file type? Can't find it in the zip file? Make sure any new software you have recently installed isn’t making the file format you are looking for in the zip folder ‘disappear’. If you don’t see it, check a known file you have used before and see if you can view it there too. If you can’t … it’s most likely a software conflict. 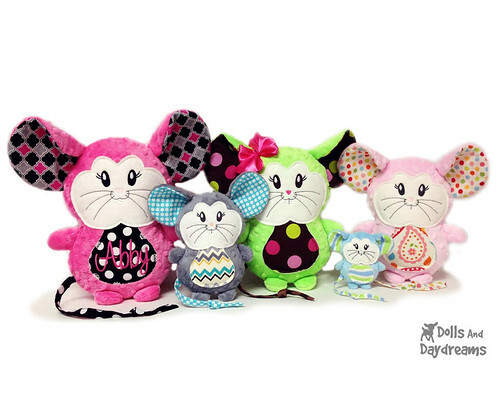 Find All of my ITH Softies and Dolls Here!